Visibility is an important factor when it comes to plowing snow. Whether it is a bright, sunny day or many hours into the night, there are steps you can take to help you do your job efficiently and safely. These straightforward tips will help you gain maximum visibility while you’re on the job. Windshield Wipers – First and foremost make sure you have a good working set of wiper blades. Unfortunately, when it’s snowing, ice buildup is always a problem. A spray bottle of deicer is a big help against the snow and ice buildup. Water Repellent Glass Treatment – Using a water repellent glass treatment, like Rain-X®, will substantially decrease the melted snow and water on your windshield. In some cases you won’t even need your wipers. Snow Plow Deflector –This is a good option for deep snow and windy conditions. The deflector will keep most of the snow in the snow plow’s moldboard. Plowing Speed – Regardless of whether you have a snow plow deflector or not, your plowing speed is going to play a big factor on visibility. Depending on the snow depth and wind, you may have to adjust your speed accordingly to reduce the amount of snow that flies over the plow and hood, onto your windshield. Headlight Adjustments – Let’s face it, snow plows take a lot of abuse and it can cause the headlight to fall out of adjustment. Before and during the season, it is a good idea to make sure your headlights are adjusted and pointed in the right direction to ensure maximum visibility. 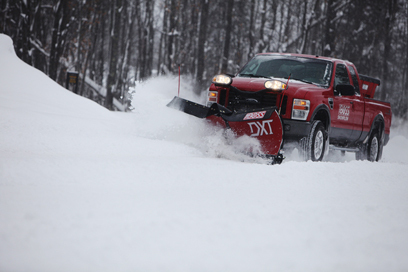 Dual Burn – If you plow rural and unlit areas at night, dual burn is a good fit for you. Dual burn allows the low and high beam bulbs on your plow to light up at the same time. Anyone with THE BOSS SNOWPLOW SmartLight 2 system has dual burn. Turn on the high beam lights on in your truck and all four plow bulbs will be on. If your truck does not have Smart Light 2, THE BOSS does have a relay kit that you can add to get the dual burn option. While driving, lower your snow plow – When moving to a new job site, lower your plow a couple inches. This will give you more vision directly in front of you and more light on the road at night. Polarized Sunglasses – This is a simple way to reduce glare off the snow. You can pick up a decent pair of sunglasses, generally, for a low price. Look around this fall when they go on sale. Strobe Light – In addition to increasing your own visibility, let’s talk about increasing the visibility for pedestrians. A strobe on the top of your truck cab is an excellent way for drivers and pedestrians to spot you. Just because you see them, doesn’t always mean they are paying attention to you. A bright, spinning, orange-yellow light will help them notice you are working. Backup Alarm – In areas that get a lot of snow, the piles get pretty high; higher than the truck and the strobe. In those types of cases, a backup alarm will alert people of your presence. When this universal alarm is sounded, individuals will be looking for the source of the noise, and it will help them stay out of your work area. Visibility is serious business when it comes to clearing snow. You need to be able to see where you’re going at all times. When the snow starts to stack higher and higher, it’s going to be difficult for you to see and also for others to see you. That’s when you need to take extra measures to make sure everyone in the area knows of your presence. By applying some of these helpful tips it will make you much safer and efficient.